“James”, originally uploaded by EcoSnake. 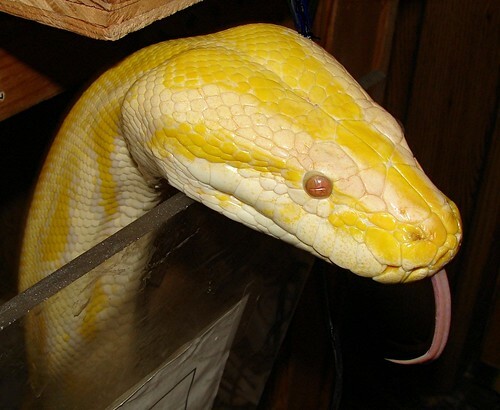 Giant pythons capable of swallowing a dog and even an alligator are rapidly making south Florida their home, potentially threatening other southeastern states, a study said. “Pythons are likely to colonize anywhere alligators live, including north Florida, Georgia and Louisiana,” said Frank Mazzotti, University of Florida Institute of Food and Agricultural Sciences professor, in his two-year study. The pythons thriving in Florida are mostly Burmese pythons from Myanmar that were brought over as pets and then turned loose in the wild. From 2002-2005, 201 of the beasts were caught by state authorities, but in the last two years the number has more than doubled to 418, Mazzotti said in his study published on the university website. The largest python caught so far in Florida measured five meters (16.4 feet) and weighed 70 kilograms (154 pounds). Mazzotti said the serpents, despite their awesome size, are not poisonous, but are excellent swimmers and able to cover great distances in little time. Some, trapped and released with radio transmitters, swam 60 kilometers (37 miles) in a few hours. Highly adaptable, pythons prey on cats, dogs, hares, foxes, squirrels, raccoons and even alligators, allowing them to thrive in a variety of environments. After populating the Florida Everglades — a vast marshland — where it is estimated they number 30,000, the giant python is now spreading across the rest of the peninsula. “Females may store sperm, so they can produce fertile clutches for years. And a 100-something pound snake can easily be producing 60, 80 eggs a year,” said Mazzotti, adding that the reptile could eventually populate the entire southern United States.